This pretty walled garden in Surrey blends both traditional and contemporary styles. In its one acre it packs in textural plantings of long-season perennials, a courtyard rose garden, wildflower meadow, kitchen garden and wide areas of lawn. After seven years in Barbara and Stephen Brooks’ care, the garden has been transformed to include softer planting, seating areas, more distinct changes of levels and, most importantly, plants to maintain interest beyond the summer months. Love this? See all our completed projects. Spend time cutting back perennials in July for a second flush of foliage and flower – Geranium ‘Rozanne’ and Alchemilla mollis respond particularly well. 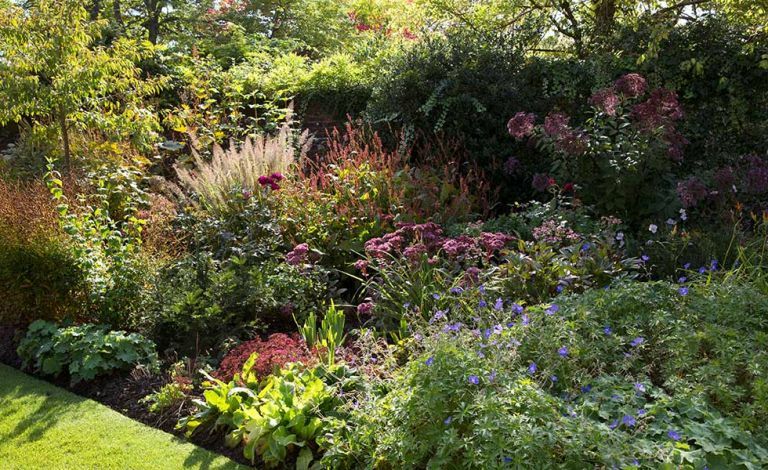 Make sure at least one third of the plants in your herbaceous borders are plants for late-season impact. Ornamental grasses are ideal, and Salvia greggii ‘Royal Bumble’ is a good choice that flowers on and on. Keep on top of the roses, deadheading them regularly. Deadhead everything that will continue flowering. Feed flowering plants regularly – chicken pellets every spring, rose food for the roses monthly, tomato food on the dahlias, Vitax Q4 to get some proper growth going and liquid seaweed on the shrubs for a boost if they need it. Include dahlias in your scheme. Include some structure with yew or beech hedging. Leave herbaceous plants standing late into the year. Their seedheads and hollow stems are good for wildlife and look beautiful touched with frost.